COMMUNITY NEWS & REVIEWS: As Christmas creeps ever closer, we can be forgiven for thinking that our community will be taking a form of hibernation until the Spring comes along to re-awaken us full of renewed vim & vigour. This is certainly not the case, as many forms of activities will be taking place within our social groups and clubs. I have included a few in the “Dates for your Diary” section for you to make a note of, should they interest you. COMMUNITY CHRISTMAS TREE: As many of you are now aware, the Ewhurst Parish community now has a Christmas tree !. Organised by the Ewhurst Parish Council, this was delivered and erected by our Parish Clerk - Richard Farhall and his trusty ‘elf’ Steve Alecock on Thursday last. (15th) This beautiful tree, approximately 12’ high and adorned with 40 metre of cables supplying 400 battery operated LED.’s sits proud on the front lawn outside of the Staplecross Village Hall, for all to see and admire. The lights on the tree will be switched on within the next few days in time for the many festive gatherings to take place within our parish. THE HYGIENE BANK: On a more serious note, I have received a missive, drawing my attention to the works that this charity carry out and requesting that I may be able to help them further by ‘Word of Mouth’ - or the ‘Power of Print’. The group state that they are working with the local community to tackle hygiene poverty as no-one should struggle to wash their hair, brush their teeth wash their clothes, change a baby’s nappy or afford sanitary protection because they have been hit by something unexpected - like bereavement; sickness, redundancy or delayed benefit payments. Basic hygiene is about dignity and their work directly benefits those in crisis. 2/3rds of children growing up in poverty live in a family where they don’t earn enough and 1 in 10 girls cannot afford sanitary wear and as a result, many have to miss school. This charity works like a foodbank, but for hygiene essentials instead and will collect any new & unopened toiletries; sanitary items; men’s toiletries; laundry and baby items you may have to spare or wish to donate. Please check out their message of ‘Nextdoor Ewhurst or their website - www.thehygienebank.com to find out how you can help them to help others. ROTHER RAMBLERS: Again we have two more walks for us to join in and enjoy should we choose to do so and the first walk is planned to take place on Sunday November 25th.and will be an 8 circular mile walk from West Hoathly. The meeting point is to be at the Public Car Park on the East side of West Hoathly village. OS.EXP135. TQ367326. (satnav RH19 4PN) at the usual time of 10.00am. 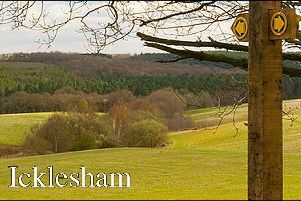 The walk notes state “ This will be a forest and farmland walk which will include part of the High Weald Landscape Trail. A picnic lunch is again suggested. Adrian is to be your ‘walk leader’ for this walk and you may contact him on: 01273~514336 or Mobile: 07729~861854 for more details. Walk No: 2 is arranged for Tuesday November 27th and will be a 6 7 mile circular stroll from Little Common. The meeting place will be The Wheatsheaf Pub’, Little Common. OS.EXP124. TQ714079. (satnav TN39 4LR) again at 10.00am. The walk notes state “The no:99 bus from Hastings arrives at 9.56am. Parking will be in residential streets nearby, so please be respectful of residents. There may be a possible café stop, and please check website nearer the date” Your ‘walk leader for this meander is to be Lucy, and you may contact her on: 01424~848332 or Mobile: 07817~279241 for all further information. ST, GILES PUB QUIZ: The Castle Inn. Bodiam are to hold a Pub Quiz & Auction on Tuesday November 27th beginning at 7.00pm. The cost of entering this evening of fun and laughter will be £12:50 per head which includes a one course supper. Tables are for 6 - 8 people and booking is requested. To do this, please email: keelingvan@gmail.com for more details. WINE TASTERS @ EWHURST: If like many of us within the parish, you enjoy a delectable glass of wine now & again, then why not consider joining in the monthly Wine Tasting at Ewhurst. Do you wonder what to serve with a special menu ? Would you like to discover a different taste of wine for a change ? What is best - White, Red or Rose’ ? ; From another country perhaps ? Can you discern the body - the senses - and aroma of a good wine ? These answers and more, can all be found within this friendly, likeable and knowledgeable group discovering just that for themselves!. This is a super little social group of like-minded people who enjoy spending a couple of hours per month, - tasting and commenting on a selection of superb wines - plus tasty bread and a few nibbles - all wrapped up in good company, in a cosy venue - that being the Herdman Pavilion, in Ewhurst Green, (TN32 5TB) The date for the November Wine Evening is Friday November 30th from 7.30pm - 9.30pm. No membership is required, - just a courtesy contact to Jan (sec) to ensure there will be sufficient wine & nibbles for all to enjoy. A charge of £5:00 per person is required upon arrival. If you think that this is something that would be of interest to you, then do please contact Janis via her email: janhooper3@hotmail.co.uk to learn more about this very friendly and welcoming group. We are a very friendly and social group and will certainly ensure you have a warm welcome upon arrival and a glass of superb wine in your hand, very shortly after.! - Enjoy ! DATES FOR YOUR DIARIES: A few advance notices of some local parish events coming up that you won’t want to miss ! ~~ 1) STAPLECROSS & EWHURST GREEN W.I. Monthly meeting and Christmas Celebrations. 2pm at Staplecross Village Hall on Tuesday December 4th. ~ 2) EWHURST, STAPLECROSS & BODIAM GARDEN SOCIETY. AGM & CHRISTMAS PARTY. Thursday December 6th. 7.30pm at Staplecross Village Hall. Please don’t let the initials A.G.M. prevent you from coming along and having a fun filled evening with lots of festive food, cheer and entertainment along the way. The AGM bit will be dealt with swiftly and surely enabling one & all to then enjoy all the fun that will follow. Please contact Gill on 01580~830551 or Pam on 01580~881839 for more information of the evenings activities. ~~ 3) STAPLECROSS LUNCHEON CLUB: A wonderful Christmas Menu awaits all the members and their guests - (as well as any members of the community who feel they would like to come along and join our small but very friendly dining group ) Christmas wouldn’t be Christmas without eating turkey with all the trimmings, followed by Christmas Pudding and all that goes with, and this meal will be no different. However, if you don’t like turkey, - or are a vegetarian, vegan or have other dietary concerns, then an alternative menu could be provided for you.- but please do contact our organisers ASAP in order for them to arrange this in time for you to join us. The ladies to contact are Sally on 01580~830000 or Pauline on 01580~830570. The meals cost £6:00 per person which is still amazing value and taken amongst congenial company is the best place to share a meal. The date set for this festive foodie gathering is slightly earlier - Wednesday December 12th. So please don’t miss it. ! ~~ 4) STAPLECROSS MC PRIMARY SCHOOL: NATIVITY PLAYS - These charming and so delightful renditions of an age old tale are always performed with such sweetness, joy and ‘gusto’ that each and every performance is a pleasure to witness. Every child in the school takes part and has a part to play, which shows us all a true reminder of what Christmas is all about. The two performances this year will take place on Thursday December 13th at 2.00pm followed by a repeat on Friday December 14th at 6.00pm. Both ‘productions’ will be staged in the Staplecross Village Hall. Please come & join us. ~~5) EWHURST GREEN -- CAROLS ON THE GREEN - A warm and welcoming invitation is extended to everyone to come along and join in the ‘singing of carols around the tree’. This is to be held in Ewhurst Green, on Friday December 21st beginning at 6.00pm. and is a really lovely way to spend a hour or two amongst family and friends, singing age old carols in a fabulous atmosphere. The hot mulled wine and mince pies also adds to the conviviality and you will be forgiven for singing out of tune here, as folk will be singing for pure pleasure, so why not come along and join in the fun and festive singing. A song sheet will be provided to hopefully, help you get the words right and a collection in aid of Ewhurst P.C.C. will be made during the singing. We all look forward to seeing you on the night. CHURCH SERVICES: Church services for the parish of Ewhurst will commence at St. James the Great, Ewhurst Green on Sunday November 25th. Next before Advent. at 9.30 am. This service will include Holy Communion (BCP) A service at St. Mark’s church, Northiam Road, Staplecross will follow directly after at 11.15am. This service will also offer Holy Communion (BCP) There will be NO SERVICE today at St. Giles, Bodiam.. If there is any church matter on which you feel you may need further assistance, especially Baptisms, Weddings and sadly, Funerals, then do please get in touch with our Priest in Charge, Canon Christopher Irvine on 01580~830925. He is always there to care and support you and unselfishly will guide you towards the solution that is right for you. ANY NEWS FOR THIS COLUMN - PLEASE CONTACT ME: Although news of ‘events and happenings’ taking place throughout our community is rather sparse at present, this does not reflect on our life in general within our parish, With the schoolchildren now firmly looking forward to the End of Term Christmas break and the activities that abound throughout the school at present, - life may seem rather quiet. But fear not residents...events are being planned for our enjoyment I’m sure and very soon this column will be buzzing with news of them all.! So if you have an event planned in the foreseeable future - whatever the nature of the event - indoor or out, large or small and you’d like some extra free coverage of it, - courtesy of the Observer Newspaper then please get in touch.- it’s of interest to you --- then it’s of interest to us. It’s NEVER TOO EARLY to send in any of the information and details regarding the event you are planning and scarily, - Christmas IS just around the corner !- so please do contact me as I’d love to hear from you and to help ‘spread the word’ on your behalf......Thank You.